I was at the Verona Opera Festival when Summorum Pontificum was published but it wasn't until All Souls Day that I first attempted to say the Old Rite for the first time, it was a 'mystical' experience, I entered a world that had been closed to me. I offered Mass for my deceased family, there was something wonderful in using the very words and rites of the Mass that would have been used for the funerals for most of them since the time of St Gregory. I am not sure that Benedict expected that ten years on this "Gregorian Rite" in every parish, or even every diocese of the world. I suspect he intended to create something at grassroots, certainly not a movement but an attitude or an awareness of the history and origins of the Mass and the Church. 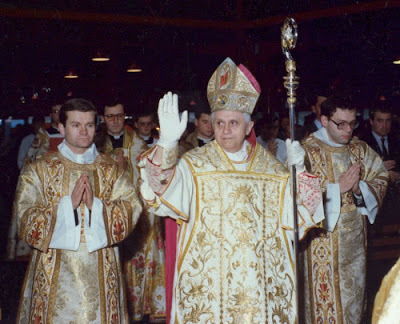 Benedict often writes quite scathingly about the Novus Ordo, "it was a rite created ex nihil ..." or "a rite that contradicts Sacrosanctum Concillium [the VII document on the liturgy]" his aim I think was not a return to the past but as he actually says, an attempt to establish two rites within the Church that were mutually enriching and to remind the Latin Church of its roots, its recent history and to see the present Church in continuity with its past. One gets more than the impression from his writings that he was dismayed by how post-concilliar liturgy had developed as a celebration of the hermenuitic of rupture, much that he tried to do was stitching the head back on to the body, or giving the Novus Ordo, as it had developed by his Pontificate, historic, dare I say, Catholic roots. Anyhow, happy Summorum Pontificum day, especially to those young priests who love the ancient Rite, and most especially to those who have some connection with this parish who have discovered a vocation through it. God bless you! If only this motu proprio is remembered of Pope Benedict it will be more beneficial to the Church than almost anything in the past. God bless Pope Benedict!! An important factor, for myself, was the raising of a new Lectionary/calendar which rendered obsolete the Old Missals and Lectionaries. At one time the Anglican and Catholic calendars were coincidental - one could even follow BBC Choral Evensong from our own Missals - now all confusion. It looked ten years ago as if Summorum Pontificum was going to be a landmark on the way back to recovery. Sadly that has not been the case. The overwhelming majority of clergy in my diocese REFUSE to celebrate the EF Mass when asked. It has been pushed to the margin, and its followers consist mostly of eccentrics, often with dubious extreme-right sympathies. It has also failed to bring about changes through an influence on the regular liturgy, which remains scarcely distinguishable from a Lutheran Mass. It seems that the battle is lost. Today we can only look to Moscow to carry the banner for worthy liturgy. What an irony that is, considering the history of the past 100 years.